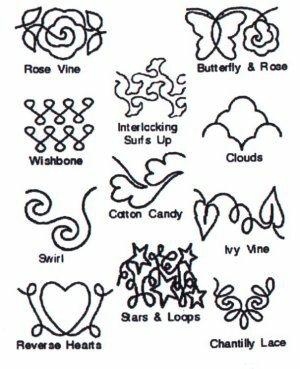 Designs for borders and blocks to make your quilt as original as you are. 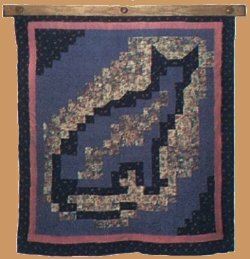 Custom quilting includes: stitch-in-the-ditch, shadow quilting, stippling and more. Custom Quilting is 3 cents per square inch. (Length x width = square inches). I will baste parallel lines 4" apart to stabilize the 3 layers for your hand quilting. Basting is .006 per square inch. (Length x width = square inches.) Minimum $35.00. Binding is applied by machine to the right side of the quilt and hand stitched to the back. Binding is .18 per linear inch. (Length x 2) + (width x 2) = linear inches. We will make and apply binding by machine for only $20. that requires reloading the quilt add $25. Continuous line quilting which covers the entire quilt top. I offer many different designs that will make your quilt unique. Backing should be 4" larger than the quilt top on all sides. Remove all pins and/or basting. Some patterns establish a top and bottom to your quilt. If there is a top, please indicate it with a note. Measure quilt to make sure it is as square as possible. Remove all selvage edges from fabric; they tend to curl when washed. Check quilt top for loose threads. Do you need an attractive way to hang your quilts now? Solid 3/4" Oak Quilt Hangers! Does not harm your quilts! Hang rugs or throws too! Availble in natural oak, medium, and dark stain. Custom sizes and woods upon request.